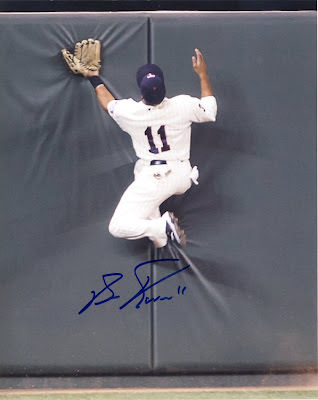 Ben Revere was signing Thursday night at Fan HQ at Ridgedale but I wasn't able to be there. Instead, I drove over Wednesday after work and placed my order and my son and I drove back today to pick them up. Both my sons and I got an 8x10 of Revere's award-winning catch at the wall from last year. This was especially cool for us because we were at that game. I also dropped off a 2012 Topps Heritage for him to sign. 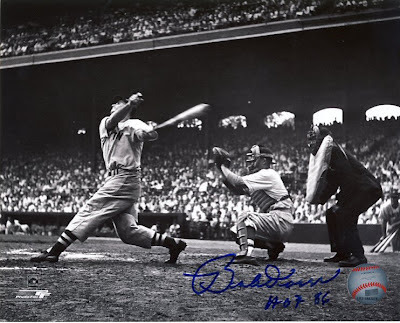 While we were there, I also picked up a nice 16x20 of Jason Kubel celebrating after hitting a grand slam to complete the cycle. This was another game that my older son and I attended, which I posted about here. 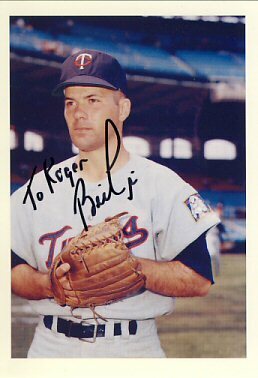 I had Kubel sign my ticket stub which I posted about here. Today I received an 8x10 back from Bobby Doerr. I sent this to Mr. Doerr early last week. A week ago I sent out a couple of requests including a Nicholas Volpe, Western Oil portrait to Bill Pleis. I received it today in just 7 days. The portrait got a little beat up on its journey there and back, but actually looks much better than it does in this scan. He was also kind enough to enclose a small photograph personalized to me. One of my coworkers was in San Francisco last week and decided to take in a ball game. Luckily for him (and me), he happened to see Matt Cain throw a perfect game against the Astros. When he emailed me that he had attended the game, I told him to save the ticket stub. He said he would if the hotel maid hadn't already thrown it away! He's not a collector. He was kind enough to save the ticket and give it to me when he returned this week. I'm always happy to get a return lately since it's been over a month since I've sent any requests out. 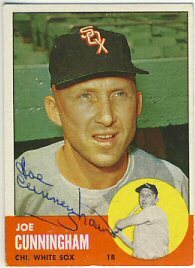 Today I received a 1962 and 1963 Topps signed by Joe Cunningham. 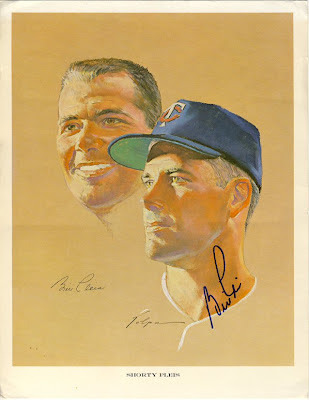 He also included a signed custom card that is made to look like a 1969 Topps. 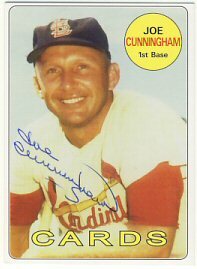 I've been so busy with my boys' baseball games that I haven't had a chance to buy any cards or send out any requests. It will probably be this way for another month or so. Although I don't have many requests out, I managed to get a return today. 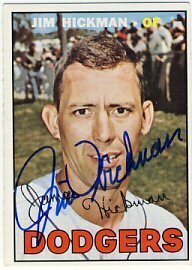 I sent Jim Hickman a couple of cards in January and I received them back today. 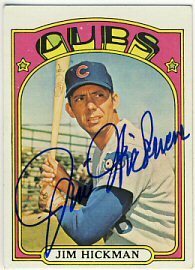 Mr. Hickman signed a 1967 Topps as well as a 1972 Topps for my set. 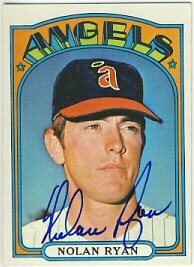 I now have 361 signed 1972 Topps. This is my 800th post since beginning this blog in October of 2008. I'm a little surprised I've kept it up this long, but I've found that I like having a record of what I get back through the mail as well as our in-person experiences. 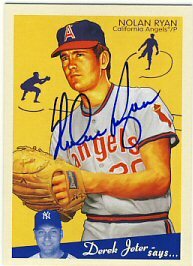 Today I received my cards back from a Nolan Ryan signing organized by Tom Orr at Atommic Sports. 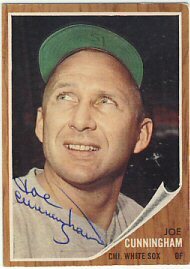 I had him sign a 1972 Topps as well as a 2008 Upper Deck Goudey. 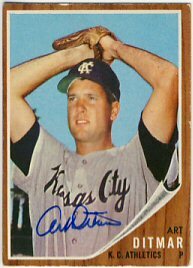 It's been quite a while since I added a card to my 2008 Goudey set. I'll have to take another look at the remaining cards I need and see if I can make some more progress on it. I'm only targeting the retired players. 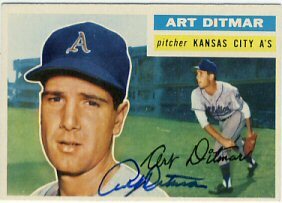 Today I received a couple of cards back from Art Ditmar that I sent in early April. 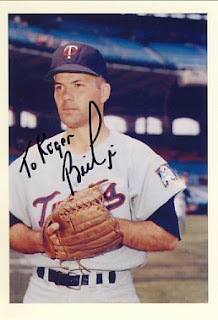 He was kind enough to sign his 1956 and 1962 Topps for me. 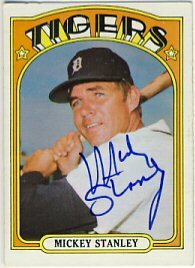 I also received a 1972 Topps Mickey Stanley signed card that I bough from Chris Potter via Ebay.